Golfers will be looking to finish their round at one of the Algarve’s nearby stunning courses a little quicker so they can enjoy the sand trap of Praia Do Carvoeiro, after it was named the best beach in Europe. European Best Destinations, the popular website dedicated to tourism throughout the continent, surveyed 12,840 travellers from 129 countries to vote for their favourite beaches in Europe. And captivating Carvoeiro with its golden sand, spectacular cliffs and the charming buildings that provide a colourful backdrop to the beach, came out on top of the entire list. It’s not the only memorable view in the area with seven superb golf courses all within just a 25-minute drive of Carvoeiro, which means the award-winning beach is the ideal location to either relax and prepare for a round – or perhaps sit back and remember some of those favourite moments afterwards. With Pestana Vale da Pinta, Pestana Gramacho, Pestana Silves, Morgado, Alamos, and the two Amendoeira Resort courses – the Faldo and the O’Connor – all within easy reach, it’s a golfer’s and beach lover’s paradise rolled into one. 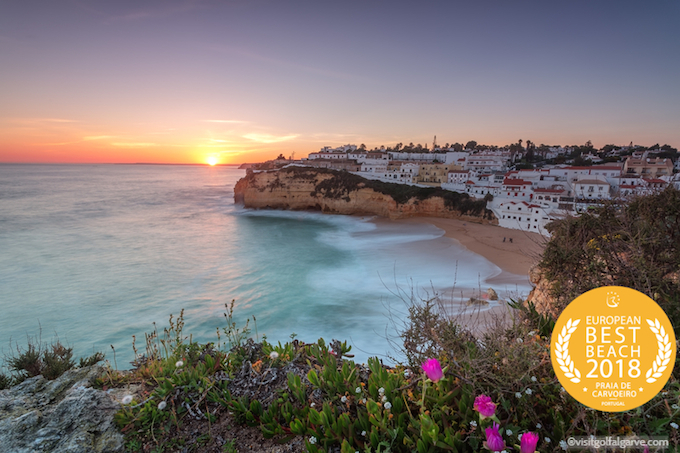 With 150 miles of coastline, the Algarve has long been associated with some of the finest beaches in the world, especially as it was voted as Europe’s Leading Beach Destination at the World Travel Awards for five of the previous six years. And with such frequent flight access into Faro from 30 UK and Irish airports, 43 golf courses in the region and a wealth of accommodation options, there are several reasons for golfers and holidaymakers to plan their next trip. Maria Manuel Delgado e Silva, Algarve tourism golf product manager, said: “We know that we are so lucky in the Algarve with so many wonderful beaches to enjoy and so many fantastic golf courses nearby. It’s the perfect combination. “We’re proud that Carvoiero has been named as the best beach in Europe, but we think there are lots of other Algarve beaches which are winners too!